Psychiatric and Mental Health Nurse’s play a very important part in our health care system. They assess patients who battle mental illness and develop plans to help them. To succeed in this field, candidates need a certification that shows you have the necessary training and skills to treat patients who suffer from mental health illnesses. The American Nurses Credentialing Center has developed a certification exam for registered nurses who want to enter this field. As with all tests, there are certain things you should know, and this guide provides answers to some of the questions you may have. 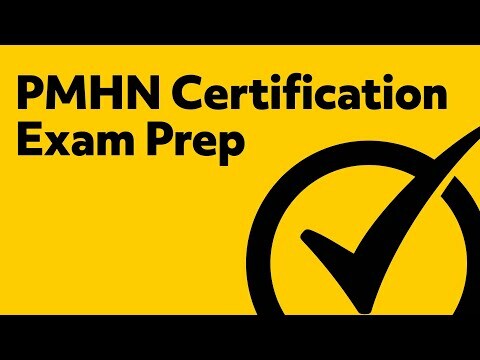 Who is eligible to take the Psychiatric–Mental Health Nursing board certification examination? OK. I meet the requirements. How do I register to take the test? You can apply online to take the exam. You may apply anytime during the year, and take the test within a 90-day testing window. What if I need to reschedule the exam? You can request a one-time extension to take the test in a new testing window. There is a $100 re-assignment fee. There are hundreds of test centers across the United States, so one should be convenient to you. How much does it cost to take the Psychiatric–Mental Health Nursing board certification examination? What if I need to cancel my test? You may request a cancellation within your testing window. An administration fee ($140) and other fees are non-refundable. There are 175 total questions. Of those, 150 questions are scored and 25 pre-test questions are not. What areas does the test cover? The test covers four subject — or domain — areas. The number in parenthesis represents the number of questions covered in each domain. Nurse-Patient Relationship and Professional Development (41): Examines the nurse-patient relationship. That includes coping and defense mechanisms, and care system support. Patient Education and Population Health (19): Includes topics that cover teaching and learning for groups and individuals. How long is the Psychiatric–Mental Health Nursing board certification examination? The exam is a total of 4 hours. You have 3.5 hours to take the test, with the rest of the time used for check-in, instruction and practice time on the computer used to take the test. What identification do I need on the day of the exam? Please bring one of these three items, and make sure they’re current (in other words, unexpired): A state-issued driver’s license; state-issued identification; passport; or U.S. military identification. If you do not bring acceptable ID to the testing center, you will not be allowed to take the test. Furthermore, you’ll be required to submit additional documentation and pay extra fees in order to reschedule. Are there items I should not being into the testing room? Yes. All personal electronic devices (cell phones, tablets, etc.) are prohibited. If you use your cell phone or any other electronic device during testing, you will be dismissed from the examination. Other items, such as books, food, drink, water, and more, are prohibited as well. Additionally, eyeglasses will be inspected, and jewelry and other accessories are subject to visual inspection. You will get your test results at the testing center, before you leave. What if I fail? Can I take the Psychiatric–Mental Health Nursing board certification examination again? If you fail, you can take the test again by waiting 60 days and paying all associated fees. We may take the test up to three times in a 12-month period. The American Nurses Credentialing Center, in its handbook, recommends a six-month study plan to prepare for the exam. This is where Mometrix can prove to be an invaluable resource. Our professionally crafted study guides and flashcards are exactly what you need to prepare for this challenging test. Need a comprehensive study guide? We have one that has been researched by a team of professionals with years of experience helping candidates prepare for important tests like this. The guide provides specifics on how to tackle the questions you will be asked. Need Flashcards? Our large, easy-to-read flashcards effectively helps you learn through repetition, and the questions cover every content area of the exam. Not only that, the cards make learning fun. You can ask a friend or relative to help quiz you on the questions you’ll need to know to pass the Psychiatric–Mental Health Nursing board certification examination. Both the study guide and flashcards contain important bonuses for your preparation — bonuses to help you with your test preparation. There are practice test questions that will help you test your knowledge on the topics you will face; a method to maximize flashcard learning; study secrets to get the highest score possible; and ways to overcome test anxiety. Mometrix Academy is a completely free psychiatric nurse certification resource provided by Mometrix Test Preparation. If you find benefit from our efforts here, check out our premium quality PMHN study guide to take your studying to the next level. 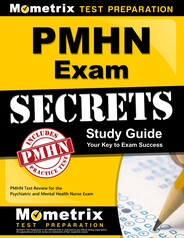 Just click the PMHN study guide link below. Your purchase also helps us make even more great, free content for test-takers. 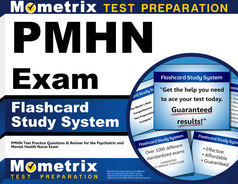 Our customers love the tutorial videos from Mometrix Academy that we have incorporated into our PMHN test study guide. The PMHN study guide reviews below are examples of customer experiences. I purchased this and already feel like I will do much better taking this test. It is clear and concise. Concise! That is what you need when you are studying for an exam and already have a challenging job. I love it! It is helpful because it covers a broad range of topics that will be needed in order to take the exam. If I have questions about any of the topics, I can research them further. I also appreciate the large quantity of test questions included in the study guide. The study guide was great. All of the information was condensed into sections and easy to understand. I was able to complete the entire study guide in 2 days. I think your product will be very beneficial as I make final preparations to sit for my exam. It is very easy to understand. Very helpful especially for me since I’m new in psychiatric nursing. The test strategies is a plus. Thanks for this fast faced review material that will sure help me a lot on my certification exam. I absolutely LOVE the exam secrets study guide! I used it for my nursing school entrance exam, my NCLEX and this cert and it helped with every exam. I strongly recommend this study guide! The book is concise and straight to the point. It is very easy to read and covers everything you need to pass the Psychiatric and Mental Health Nurse Exam. It saves you a lot of time especially if you are a working professional. My co-workers also used this book to prepare for the exam and they passed with flying colors. I highly recommend this book to RNs who work in the field of Mental Health to use as a tool in preparing for the exam or as a reference at work. I have purchased several study guides to prepare for the PMHN exam. This has been the easiest to navigate. I have benefited the most from the practice test and questions. The rationales are helpful and make the content easier to understand. I work with nurses that have used this as a tool to prepare for their exam and they have all been successful. It was a great study tool full of tips, facts and practice questions along with rationales for the answers. I have recommended it to all my peers who are preparing for certification. The book is laid out in an easy to use format and has helped me tremendously.